NS7 II, MIDI Control Surface for DJ from Numark. Product replaced by the Numark NS7 III. 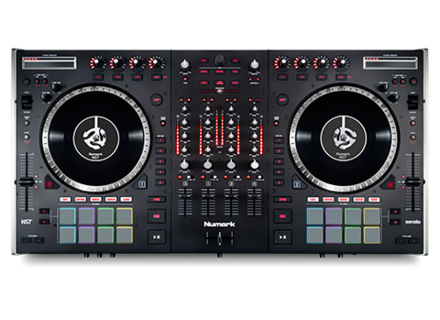 The Numark NS7 II DJ MIDI control surface that had been introduced at Winter NAMM, is now available in stores. New features of the NS7 II had already been detailed in January in this news, including the addition of 16 backlit velocity-sensitive MPC pads (thanks to the Akai Pro partnership) and the collaboration with Serato in order to provide the Serato DJ software with the controller. The pads can then be assigned to the Cues, Auto/Roll, Loop, Sampler and Slicer performance features in Serato DJ. 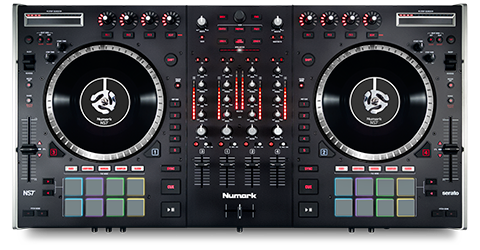 Suggested price of the new Numark NS7 II in Europe is 1199€. Full details are available at www.numark.com. New Pioneer CDJ-900NXS player Pioneer introduced the new generation of CD players for DJ, the CDJ-900NXS, an evolution from the CDJ-900 that ships with the rekordbox software. Serato DJ updated to v1.5.2 Serato updated its Serato DJ mixing software to version 1.5.2, a new version that add a new expansion pack and controller compatibility. Mixed in Key unveils Flow We already knew the features, we were only waiting for its name and pricing. The new Mixed In Key software goes by the name of Flow and is available.